The music on my iPod is a cornucopia that defies organization into neat playlists or genre. The best I can manage is to make play lists based on rhythms. If I didn't care about logical listening, there is another way I could organize some of the songs. I could make one playlist of Unofficial MMW Book Theme Songs. Today, I reveal what would be song one on that list. 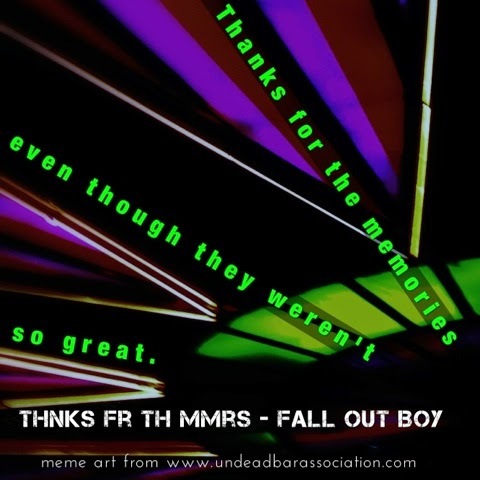 Thnks fr The Mmrs by Fall Out Boy. There are four reasons I associate that song with book 1 of the Undead Bar Association Series. 1) The song's popularity peaked while I was in law school, and my experiences in that particular institution inspired some of the colorful incidents in Matriculated Death. That's not to say the Dean of my law school was a vampire, of course. But I'm not saying he wasn't. 2) The beat and rhythm in the song are fantastic. Perfect for slipping out of the law school, facing a horde of zombies, and running through a ghost town to destroy an infected book. 4) Monkeys. Originally, Matriculated Death included monkeys of the hypothetical and flying variety. My editor insisted they be cut, and they were. But for this song's music video, the monkeys are running the show. Stay tuned here to learn about music and writing for other books in the Undead Bar Association series.